The brainchild of Dr Janine Ellenberger, GR8SKN is made with the best in proven scientific ingredients, suspended in natural ingredients, without excess harmful chemicals and preservatives. Manufactured in SA, it’s also available in the US and Australia. Try this product because: This powerful yet gentle serum offers fat-soluble forms of triple vitamin A which can help treat blemishes, minimise hyperpigmentation, treat uneven skin tone and up hydration levels. It’s a great vitamin A product to use if your skin is sensitive to regular vitamin A products or if you prefer a more natural approach. 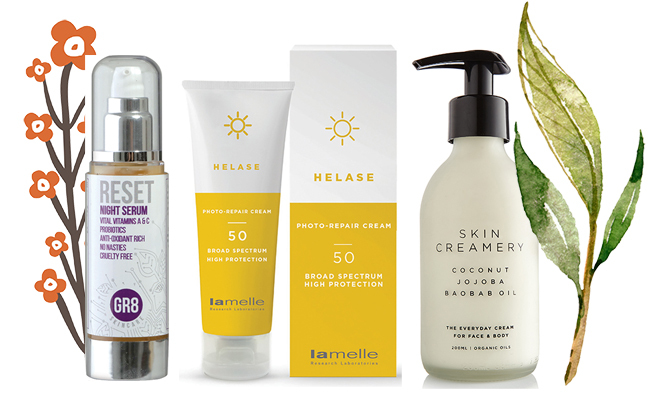 One of SA’s most respected cosmeceutical skincare brands, Lamelle, produces highly advanced products both for the professional and consumer market. They’re known for having introduced loads of “firsts” to the South African market and offer extremely competitive prices. Try this product because: This powerful sunscreen offers protection from the full spectrum of light, including visible light, too. It also helps fix recent DNA damage caused by the sun, plus it contains a super antioxidant, Pycnogenol, which destroys harmful free radicals and reduces the number of enzymes that directly cause thinning and sagging of the skin. This is a great everyday sunscreen to complement your anti-ageing regime. A luxury natural skincare brand, Skin Creamery is kind to the earth, and kind to the skin. The products are committed to simple natural living, consisting of only the finest organic ingredients and each ingredient is selected for its unique healing properties. Try this product because: The Everyday Cream can be used on the face and body and is suitable for all skin types. It contains nourishing coconut oil, baobab oil and jojoba oil that offer long-lasting hydration and restore the skin’s natural glow. True to their ethos, the product is housed in glass and the beautiful inner and outer packaging ensures it makes a beautiful gift. A 100% pure and natural skin healing range, BaoCare utilises rare baobab oil which is known to help heal the skin (thanks to vitamins A and E and essential fatty acids), soothe discomfort and itchiness and increase elasticity and cell regeneration. Try this product because: A natural treatment for eczema, this nourishing oil is enhanced with anti-inflammatory calendula, evening primrose oil and Schisandra, and ancient Chinese anti-irritant remedy used as a treatment on sensitive and hyper reactive skin. It absorbs easily and quickly into the skin, leaving a satiny feel without a greasy residue and major relief for the discomfort associated with eczema. Esse products create an environment on the skin that favours the growth of beneficial microbes. Why? Because optimal skin condition depends on the probiotic microbes living on and in it. Without microbes, your skin can’t perform its basic functions and the rate of skin ageing increases sharply. Certified organic, vegan and cruelty-free, Esse supports fair trade and is a carbon-neutral company. Try this product because: The Probiotic Serum uses probiotics to actively shape the skin’s ecosystem. It contains 1 billion live probiotics per millilitre – the first serum in the world to use live probiotics. In doing so, the product is able to rectify imbalances and strengthen barrier function for a firmer, fuller, more resilient skin. The Probiotic Serum slows ageing by improving moisture retention and reducing the rate of elastin and collagen degradation through the action of probiotic microbes. 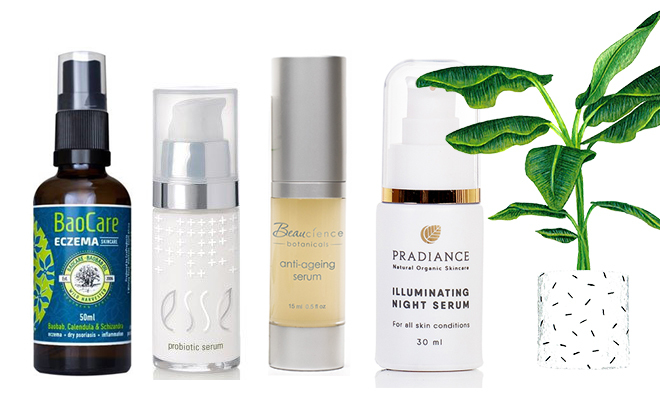 All Beaucience products contain a breakthrough botanical called PROTEASYL (created from the extraction and purification of the pea), which works naturally with the skin to prolong its youth. The range comprises a wide variety of natural oils and botanicals and is free from chemical contaminants. Try this product because: Containing antioxidants like green tea extract and botanical extracts, this light lotion smoothes expression lines and promotes a youthful appearance, whilst cooling aloe vera has a soothing effect on the skin. Despite it’s light emulsion consistency, it feels luxuriously rich on the skin. Pradiance believes that everyone should have access to natural and organic skincare, regardless of their income. Their hero ingredient, Kigelia (also known as the Sausage Tree), has extensive healing powers, and is incorporated in all their products. Try this product because: This concentrated serum is infused with healing plant extracts to help balance and heal pigmentation, uneven skin tone and scar tissue. It also has firming and toning abilities thanks to the Kigelia content. Designed by a grooming expert and makeup artist, FINO was created to combat the common after-effects of hair removal. Effective and affordable, it’s a popular product on photo shoots and film sets. The products are suitable for all skin tones and skin types and a version for men is available too. Try this product because: Not only does it feel moisturising and soothing on the skin, Soothe WOMAN significantly minimises razor burn and ingrown hair. It helps prevent redness and sensitivity, as well as the uncomfortable itch associated with hair growth. It’s suitable to use after shaving, waxing, epilating or any other form of hair removal. A favourite among SA women, Justine has stood the test of time, offering innovative products that meet the unique needs of South Africans. Affordable and results-driven, they offer something for everyone, no matter what your skincare concern. Try this product because: This proudly South African product was the first tissue oil to be launched in South Africa. Over the years Justine has improved their formula ensuring they provide women with the finest skincare to meet their specific needs. This improved tissue oil formula helps reduce the appearance of scars and stretch marks in just 14 days! Tried and trusted for sure. Bramley understands the financial pressures that a lot of South African women face, and that there are a limited number of brands offering great quality products at affordable prices. With this in mind, Bramley set out to create body and personal care products that are effective, attractive and smell great, without charging an arm and a leg. Try this product because: Don’t be fooled by the low price – this tissue oil offers serious hydration and goes to work fast on scars and stretch marks. Plus, it has a really lovely floral scent that’s soft and feminine, and won’t go to war with the scent of your perfume. 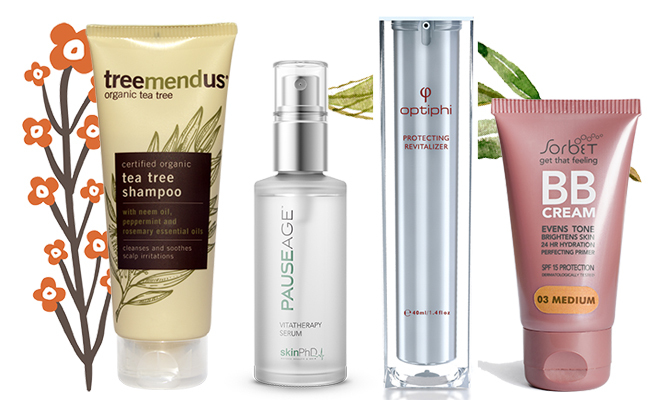 Treemendous is South Africa’s first range of certified organic tea tree body care products. Tea tree oil, known for its gentle cleansing and healing properties, is the key ingredient in the Treemendous range. The tea tree extract used in Treemendous products is certified organic by ECOCERT, to guarantee the highest quality and purity. Treemendous tea tree oil is organically grown in South Africa, without synthetic pesticides or fertilisers. Try this product because: A shampoo containing natural ingredients is not always easy to come by, but can do wonders for a sensitive scalp or hair that’s damaged from chemicals and over-processing. This gentle shampoo with tea tree, peppermint and neem oils deep cleanses your hair and prevents dry, itchy scalp conditions. Rosemary stimulates growth and adds shine to your hair, whilst invigorating the senses. skinPhD offers an advanced skin and body cosmeceutical range of products and services, scientifically developed for all skin types. Their products rely on bio-active ingredients working beyond the skin’s surface to ensure real changes in the appearance of the skin. Try this product because: This serum accelerates cellular turnover and increases the skin’s metabolism for a youthful and even-toned complexion. It includes antioxidants to fight off harmful free radicals and has a silky texture which makes application a dream. One of the country’s most well-respected skincare brands, Optiphi is part of a much larger group of companies specialising in medical supplies and equipment, meaning they have access to cutting-edge medical knowledge and technology. As such, their products are known to contain top quality medical-grade ingredients that deliver on their claims. Try this product because: This serum contains eight active ingredients that work together to protect skin cells from the effects of sun damage and targets and prevents skin ageing. It is designed to help combat infra-ageing, the term used to describe the damaging effects of infrared radiation on the skin (think blue light from devices and the sun’s harmful rays). Limiting the damage caused by heat in the skin and the breakdown of the dermal structure is achieved by the innovative addition of Knotgrass Extract. This extract not only reduces the appearance of wrinkles and fine lines, but also protects the fibres from future UV and infrared damage. South Africa’s favourite beauty salon is now just as famous for their wide range of Sorbet-branded skincare, body care, makeup and home items. Great quality products at competitive prices have made Sorbet items a favourite among consumers and beauty editors alike. Try this product because: Offering hydration for up to 24 hours, this BB cream leaves the skin feeling and looking fantastic. It gives plenty of coverage without looking cakey and whilst giving the skin a radiant glow. It also helps even out skin tone and minimises the appearance of pores. Bio-Oil took the South African market by storm when it released it’s first product for stretch marks and uneven skin tone back in 1987. Recognised internationally for its healing, hydrating and scar-minimising abilities, Bio-Oil has become a household name and has a major celebrity following. Try this product because: The next generation in the treatment of dry skin, this gel builds on the existing dry skin technologies and improves on it by replacing the in-active water (around 70%) in these formulations with oil, making the product 100% active. It is intensely hydrating and solves dryness on even the most stubborn of areas like elbows and knees. Biomedical Emporium cosmeceutical skincare comprises of the maximum amounts of active ingredients at optimal concentrations, making each product highly effective. Product formulator, Dr Judey Pretorius, is a highly accomplished Biomedical Scientist and product development specialist with substantial experience in wound healing, regenerative medicine and cell therapy. Try this product because: Containing optimal amounts of top quality retinol (the answer to just about every skin concern), this night-time serum restores the skin’s youth and delays cellular ageing. It improves and protects the skin against signs of sun damage, assists in cellular energy metabolism, promotes moisture control and contains powerful antioxidants to reduce the effects of free radicals on the skin. 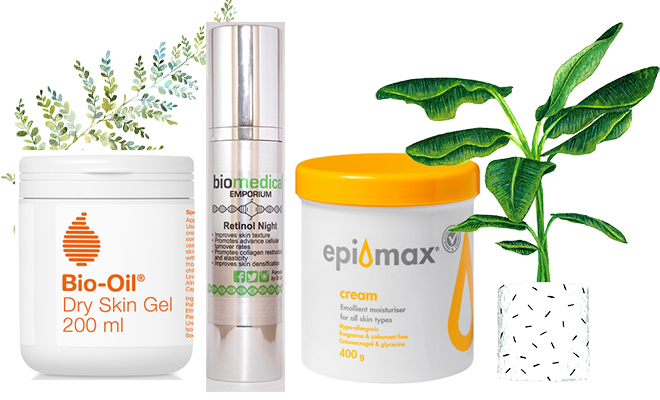 The Epi-max range of emollient products is ideal for any climate and people of all ages with dry skin and dry skin conditions like eczema and psoriasis. From newborn to ageing skin, Epi-max® is a gentle all-purpose moisturiser and emollient cream. A cost-effective solution for dry skin that is gentle and mild enough for the whole family. Try this product because: The first product to be created by Epi-Max and its best-seller, this all-purpose moisturiser is the solution to dry skin. Free of harsh chemicals, fragrances and colourants, it is extremely gentle – so much so that you can use it on your kids! It’s even suitable to apply on eczema and psoriasis. In the heart of the Western Cape winelands you’ll find TheraVine, a scientifically advanced range of results-driven health and skincare products. Their products combine and fuse the power of active ingredients, grape derivatives and botanical extracts to bring you skincare that’s perfectly balanced for radiant skin. Try this product because: One of TheraVine’s most renowned and best-selling products, this luxurious treatment cream fights premature ageing thanks to the powerful action of Trylagen. With regular use facial contours appear more shaped and the skin’s texture is drastically improved. It also works to reduce wrinkle depth, increase hydration levels and restore the skin’s hydro-lipid film. 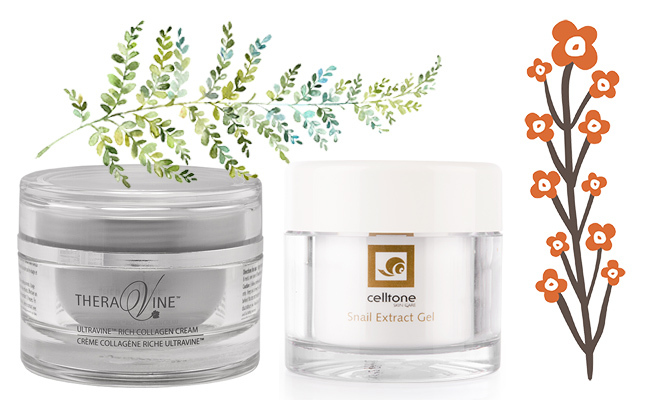 Celltone is a unique skincare range made with Snail Gel extract. This global phenomenon taps into one of nature’s beautiful secrets. Many years ago, snail farm workers discovered that while harvesting snails, their hands became softer, smoother and younger-looking, and this is where the idea of Celltone was born. Try this product because: Suitable for both the face and the body, this gel has been clinically proven to reduce the appearance of dark spots, stretch marks and wrinkles. The gel consistency is light and easily absorbed, making it a pleasure to apply anywhere on the body. Since 1987, Ladine™ has been trusted by professionals for the treatment of distinctly beautiful, yet complex and fragile Afro hair. Hair that has been chemically treated requires special at home hair care. For this Ladine has created a range of unique products suitable for all types of curly hair, to add moisture which is so desperately needed in curly hair, to condition, to add softness and most importantly repair the hair. Try this product because: The Ladine Nutri-E is a unique formula that contains vitamins and carrot oil to help improve hair moisture and prevent a dry, flaky scalp. It reduces inflammation and repairs damaged hair follicles, softens hair and adds shine and protects the scalp from chemical damage and tension from braids. An all-round hair saviour! 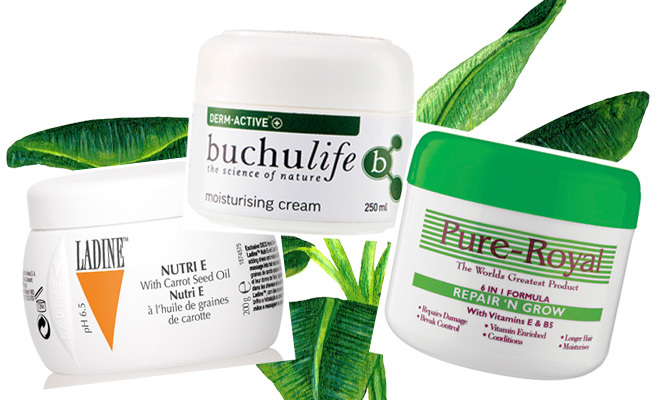 Buchulife uses buchu, a fynbos plant native to the Western Cape, in a range of health and skincare products. Buchu was traditionally used by the San and the Khoi as a cure for all ills due to its anti-inflammatory, antibacterial, anti-fungal and antihistamine properties. Try this product because: This moisturising cream harnesses the anti-ageing and health properties of buchu, and contains Quercetin, a naturally occurring component of buchu, which has been recognised for its breakthrough anti-ageing and antioxidant properties. Due to the natural anti-inflammatory properties of buchu, this cream can also be used to manage the symptoms of chronic skin conditions such as eczema. Pure Royal creates a variety of hair care products designed for the unique needs of ethnic hair. Try this product because: This leave-in product is a unique intensive hair and scalp treatment. Enriched with vitamins E and B5, it conditions and moisturises to give you longer, stronger and softer hair that shines with health. It can be applied to the scalp daily for optimum results. 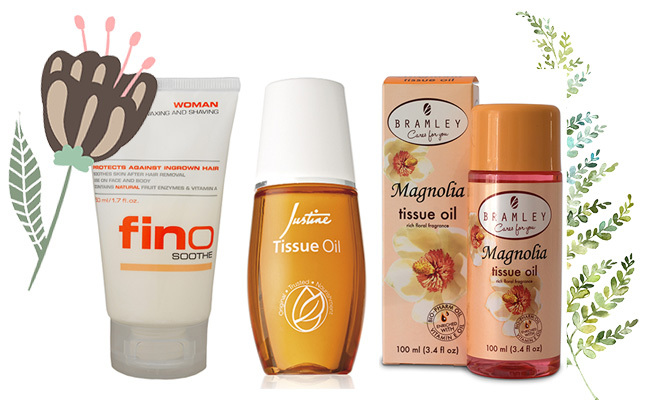 The Justine Tissue Oil has being around for years and I swear it is for a good reason. This product works wonders and although the packaging changes, the good quality formula remains. They also have a tissue oil specifically for the face and it contains rosehip oil which is a helpful product. It was a product I used daily on my scar caused by stitches (on my face) and it was of great help. It also comes in a lovely pump glass bottle for convenient use.